Prof. Dr.-Ing. Andrés Cura Hochbaum, Antonio Lengwinat M.Sc. 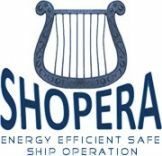 The 2012 guidelines on the attained Energy Efficiency Design Index (EEDI) for new ships (MEPC.212(63)) represent a major step forward in implementing the REGULATIONS ON ENERGY EFFICIENCY OF SHIPS (resolution MEPC.203(62)). There are, however, serious concerns regarding the sufficiency of propulsion power and of steering devices to maintain the manoeuvrability of ships in adverse conditions, hence the safety of ships. This gave reason for additional considerations and studies at IMO (MEPC 64/4/13). The aim of the proposed research project is to address the above by: further development and refinement of hydrodynamic simulation software tools for the efficient analysis of the manoeuvring performance and safety of ships in complex environmental conditions; Performing seakeeping/manoeuvring model tests in combined seaway/wind environment for different ship types, to provide the required basis for the validation of results obtained by numerical simulations, whereas full scale measurements available to the consortium will be exploited; Investigating the impact of the proposed new guidelines on the design and operational characteristics of various ship types; development of new guidelines for the required minimum propulsion power and steering performance to maintain manoeuvrability in adverse conditions; preparing and submitting to IMO a summary of results and recommendations for further consideration. At TUB we are involved in different work packages of the project, comprised of numerical calculations (RANS) and model tests. The investigated vessel is the Duisburg Test Case (DTC), a hull design of a modern 14000 TEU post-panamax container carrier. The model tests at TUB, consisting of added resistance tests in head seas for 8kn and 16kn as well as mean force measurements at zero speed for regular waves at different encountering angles, have been successfully completed. The obtained test data consists of mean forces and moment RAOs and the motion RAOs for the investigated waves. An Example of an Added Resistance tests of the SHOPERA test campaign can be seen in the video (wavelength to shiplength is 0.85, wave steepness is 0.2, forward speed is 16kn full size). 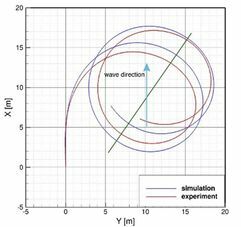 The numerical manoeuvring prediction of the DTC vessel in waves is performed with a coefficient based approach. The calm water manoeuvring data is obtained through captive model tests performed with our RANS code NEPTUNO. The code is also used to obtain the forces on the hull due to waves. Calm water manoeuvring coefficients are linearly superposed with coefficients obtained from calculations of the hull in waves in order to simulate manoeuvres in seaways. An exemplary result of wave forces on the hull can be seen in the figure below. With the above briefly described approach, we are able to predict manoeuvres in waves and can additionally incorporate effects due to wind and currents. To validate such predictions, a large series of tests was performed at three other partner testing facilities: Flanders Hydraulic Research, CEHIPAR and MARINTEK. Free sailing manoeuvres (zz-manoeuvres and turning circles) for the DTC in waves were performed at MARINTEK. In the figure on the right a turning circle test (red trace) in initially following seas is compared to our numerical prediction (blue trace). Projektpartner: National Technical University of Athens, Germanischer Lloyd SE, Det Norske Veritas AS, Lloyd's Register EMEA, MARINTEK, Instituto Superior Técnico, Universität Duisburg-Essen, RINA Services SPA, Flensburger Schiffbau-Gesellschaft mbH & Co.KG, Uljanik Shipyard, Teknologian Tutkimuskeskus, Flanders Hydraulics, Canal de Experiencias Hidrodinámicas de El Pardo, Unicersity of Strathclyde, Danmarks Tekniske Universitet, Technische Univeristeit Delft, Naval Architecture Progress, Danaos Shipping Company Ltd., FOINIKAS Shipping Company, Calmac Ferries Ltd.